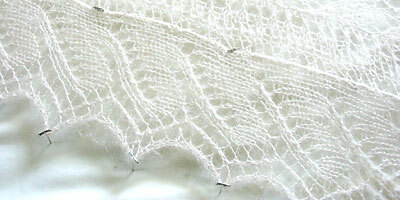 This was my first real lace project, with actual laceweight yarn and an actual picked up edging. It was fun. It was time-consuming. And they ain’t kidding when they say blocking lace is like doing crazy voodoo. If you’re going to use the Kidsilk Haze to knit this pattern or frankly anything else, be extra-vigilant about mistakes because that stuff? Does. Not. Frog. Otherwise, it is an absolute joy. The yarn is so soft, and it has such a lovely halo. And it’s warm too. I suspect that the stole would be warm enough to guard a strappy dress against a crisp fall day. The design of the stole is gorgeous, and hats off to Eunny for that. If you’re knitting this stole, be sure to check out this Knitter’s Review thread and read Eunny’s pattern corrections and other comments (4th post from the top), as they’re very helpful. Knit 25 pattern repeats, repeating the center 16-stitch panel three times instead of four. This gets you 300 rows total. Pick up 200 stitches along each long edge. I had a bit of trouble with the mitered corners, probably because I can’t follow directions, and things didn’t go quite as planned when I seamed the edging together and I wound up with a big hole in one corner that had to be sewn shut. Other than that, the pattern was completely smooth sailing. The finished, blocked, stole is 5 feet long by 2 feet wide; the main body is 52in by 16in with a 4in-wide edging. I didn’t measure it before blocking, but I think I gained over a foot vertically and about ten inches horizontally when I blocked it. I really stretched the heck out of that thing, even blocking it a second time to make it the full two feet wide and spread the pattern out even more. The transformation that occurs during blocking is truly amazing. From the weird, wrinkly lump, to the pitiful, wet lump, to this glorious piece of lace. So awesome. I’ll probably knit another one some day, since this one was so much fun. Thanks, Eunny! CogKnition posted this on August 20th, 2006 @ 7:39pm in Finished Objects, Lace, Scarves & Wraps | Permalink to "Print o’ the Wave Stole"
Oh, wow. That really is incredibly gorgeous. I really need to make myself one. Stunning. You did beautiful work! Congrats! Wow, wow, wow! It looks absolutely perfect! Great job! Yours is gorgeous, and reminds me that I really need to block mine. I cheated too and did not graft the centre. Wow–that is absolutely beautiful–I can’t believe you are new to lace. Congratulations! 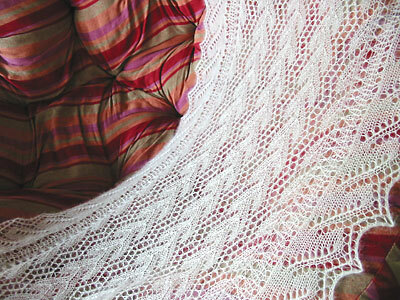 It is gorgeous true, colors, texture… Knitted lace is like wearing snowflakes I always say. I’m on the process with th POW myself, and doing it out of cobweb weight yarn, Merinosilk by Grignasco, so I must do some alterations on the pattern too…. still thinking how to do it :-). Your shawl is beautiful. Congratulations. A gorgeous job. And you are a beautiful model! A trick for frogging Kidsilk Haze: put it in the freezer for a while. It seems to glide better when very cold. And then go stitch-by-stitch, rather than pull. This helped me in a few jams. It is better to just do right the first time with the stuff, though, I agree. I found your blog around a couple of corners. I’ve started the same stole and ran into the problem about the graft. I’ll probably do the same thing as you, keep on knitting, except I’m going all the way, the full size. Your definately look great!! What size needles did you use for this project? I’m planning a few things using fleece artist mohair and love the stitch definition on your stole, and would love to achieve a similar effect! I am in stunned amazement of the beauty of your shawl. 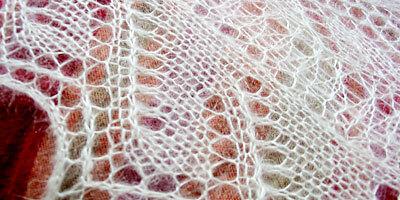 Last night, I cast on for the same shawl, using cobweb wt. Skaska Designs cashmere. Eunny is wonderful–I learned provisional CO from her instructions. Glad I found your blog–I’m inspired to keep going so that I can end up with something as lovely as what you made. correctly as *YO,K2,(YO,K2tog) to marker, YO, K2 with the repeat for the entire line ,OR, just *YO,K2 (YO, K2tog)as your repeat until you get to a marker and then do a YO,K2 after the marker? Any advice for me?